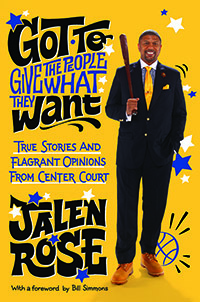 A philanthropist who truly gives from the heart, Jalen established the Jalen Rose Foundation/Charitable Fund to create life-changing opportunities for underserved youth through the development of unique programs and the distribution of grants to qualified nonprofit organizations. Grants focus on education and sports and are distributed in Jalen’s hometown of Detroit as well as other communities in need. Since the foundation’s inception in 2000, Jalen has personally distributed more than $1.3 million in charitable donations. PLEASE NOTE: grant proposals are accepted by invitation only. In 2003, The Jalen Rose Foundation made a substantial gift to the University of Michigan to endow a scholarship for an incoming freshman. The Jalen Rose Endowed Scholarship is available to a first-year student with special consideration for students who come from the state of Michigan and either resides in an inner-city area, or is a member of an underrepresented group. The scholarship award is based on both merit and financial need. The annual scholarship completely covers the cost of in-state tuition, as well as provides support for additional expenses and is renewable for three additional years, provided the student recipient meets the eligibility requirements. For eight consecutive years, The Jalen Rose Foundation awarded college scholarships to Detroit high school seniors – each recipient received a $10,000 scholarship payable over four years to help them achieve their college dreams. Jalen, who attended Detroit Southwestern High School, designated a minimum of one scholarship to his alma mater annually. Winners were selected based on academic achievement and goals, extracurricular & community activities and financial need. Through this program, 38 students have had the opportunity to attend college. Please note: although students are enrolled in college through 2014, this program is no longer accepting applications.